COTE DE TEXAS: A True American Farmhouse–In Texas! A True American Farmhouse–In Texas! A few months ago I got a call from interior designer Ginger Barber asking if I wanted to show pictures of a country house she had recently completed – located about an hour 1/2 from Houston. Of course, there’s no need to even ask! I am always thrilled to show a house decorated by Ginger. As you know, Ginger Barber is one of my favorite designers – I have long loved her easy, casual aesthetic and I never fail to learn something new from her different projects. Unfortunately, this house was being published in the summer issue of Luxe Magazine, so we had to wait a few months before we could show these gorgeous photographs taken by Nick Johnson. The best part of waiting is that while the magazine spread was indeed lovely, I am able to show so many more photographs here – which is the beauty of the internet blogging! The house was designed by Curtis & Windham Architects and built by RB Ratliff Builders. Landscape by Sarah Newberry. The house is over 16,000 sq. ft. and has 9 bedrooms and 11 bathrooms. The couple came to Ginger looking for a country home near Houston. They needed a place for their large extended family to enjoy holidays at, but, it also needed to be just right for much smaller gatherings. The perfect property was a 100 acre horse farm – full of aged oak trees and rolling hills. This is not the first house Ginger has decorated for the family. There is also a vacation house on the east coast that was published in a national magazine a few years ago and, there is their home in Houston. When designing the house, Curtis & Windham sited it on the highest point in order to maximize the views. There is a stream on the farm, which was fed into a newly created lake. The house is set back from the road – so that the approach to it takes a bit of time as the driveway winds through the trees. Finally, the gravel road reaches a stone fence that encloses a grass lawn with an allee of shade trees that leads to the stone farmhouse. The center portion of the house is symmetrically designed, but there is a long wing on the left side that is not repeated on the right. Surprisingly, the house is made mostly of stone, which makes it so much more substantial. The main living area is in the center section of the house and faces the back property. To the right, on the first floor, is the master bedroom suite. To the left and in the left wing is the kitchen and family room which overlook the swimming pool. Once inside the low enclosed stone wall with its gravel paths – there is an antique sundial. What I love most about this house is that it is American. It’s not pretending to be some Italian villa or a Provencal farmhouse either. It’s not some faux Belgian estate, nor a Swedish one. It is just American, which makes it seem so much more honest. A close up look of the front door that opens to a small entry. The spiral staircase is to the right in a room of its own. Through the glass window in the door you can see out to the back property. The left wing. Along this wing, there are two bay windows found in the family room – with a hanging wall fountain (seen above) between them. The back side of the house: the center portion is the large living/dining room. To the left is the master bedroom suite and to the right is a paneled sitting room. In between the living room and the sitting room is the wet bar. Notice how the property terraces down with slate steps. And notice the beautiful railing above the first floor. At the very right of the property is the pool and pool house – you can barely see the pool area since it is lower than the house. A close up of the back porch that leads off the formal living/dining room. A side view of the back porch. I love the railing on the second floor terrace. Here you can see the back lawn that terraces down to the lake. A mist filled view of the property as seen from the back of the house. Beautiful! A view of the back from afar showing how the house was sited on the highest part of the property – affording great views. Here is the large swimming pool of course! This is Texas! It sits off the wing on the left side of the house. Ginger used an assortment of teak and wicker furniture around the pool. The pool house. Notice the clock tower! I love that! Ginger decorated the pool area as an extension of the house. The printed fabrics are muted Rose Tarlow. The wing with its long screened in porch overlooking the swimming pool and pool house. The kitchen and family room open onto the screened in porch. The stream located on the property was fed into this man made lake. I love the screened in house – perfect to guard against mosquitos while hanging out at the lake. A beautiful view of the lake which shows how high the house was sited to get the best views of the property. You enter the house here, with the staircase on the right through the opening. The entry and stair hall have stone floor while the rest of the house has dark hardwoods. The staircase is quite beautiful in its simplicity. I love how the landing curves forming a perfect half circle. Isn’t this a gorgeous photograph by Nick Johnson? The formal living/dining room is past the entry – and runs the width of the main section of the house. The room is behind these two windows and double doors. And here is the living/dining room. The ceiling is 15’ ft tall. Notice the beautiful mill work. The room is half dining room and half living room with a matching fireplace at each end. Notice how Ginger placed matching mirrors and consoles between the two windows and the center door. AND, notice the three large chandeliers – love them!!!!! On the wall opposite the windows, there are two book shelf bays. While the room is filled with fine furniture and antiques, it is still welcoming and doesn’t give off that don’t-touch vibe. I also love the chic sophistication found here and am thrilled Ginger avoided a typical Texas farmhouse look. Instead of Texana, this room could be found anywhere on the east coast, or even in England. Looking back towards the entry hall and out the front door. At the dining end, Ginger used green leather on the English styled chairs. Notice the bay at the left behind the tall columns. And through the door way, up the steps is the bar and paneled sitting room. One of the two book shelf bays. Beautiful library steps. I love the way the library is incorporated into this great room. Wonderful green leather – such an unexpected touch. Ginger piled the table high with books – making it double as a reading area. The seating area of the large room. The leather sofa is an antique. The two rugs are not matching – but they are complimentary. In Luxe Magazine, Ginger said all sofas are 96” – the perfect length for napping. See? You always learn something new from her! Here you can see the second book shelf bay that is across from the seating area. The orange velvet picks up the same accent color found in both rugs. To the right of the fireplace is the doorway that leads to the master bedroom suite and sitting room. In this close up, you can see the subtle patterns – a toile and a check – that Ginger chose for this room. The painting over the fireplace is gorgeous! Off the living room is the master bedroom suite – with this sitting room. Notice the shiplap walls and the antique beams. Again, Ginger used a mixed of antiques and plush upholstered pieces covered in subtle colors and patterns – like this tiny check. Isn’t that a great fabric? Notice the art work behind the sofa, love! And across from the sofa – looking out at the back acreage - is this desk with antique map. I love the antique leather chairs. The master bedroom overlooks both the back yard and the side yard. Ginger filled up the large room with enough furniture so that it doesn’t look empty – something that many designers unfortunately neglect to do. There is nothing worse than a large room without enough furniture – it looks so empty and cavernous and unfinished! Love the Bennison fabric used on the bed pillows. And love the long console at the window. The statue placed at the side yard is seen from both the bedroom and bathroom. Beautiful painted chest! And beautiful trumeau over the fireplace. Such a pretty fireplace. Does it hide a flatscreen? Probably. And the master bathroom. I love how Ginger used muted antique rugs throughout the house – even in the bathroom. Back in the living room – we’ll go to the left side of the house now, up the steps, just past the dining area. There is a wet bar that leads to a smaller sitting room. The wet bar connects with this sitting room which overlooks the back yard. Here Ginger brought in a some light blues and lilacs in subtle toiles and checks mixed with khaki. Beautiful paneling. And notice another antique map – this time of Houston, Texas, a sentimental choice. This room leads to the kitchen and family room in the left wing. Looking at the front façade, the left wing holds the large family room which overlooks the screened in porch and swimming pool. The left side of the house with the long wing houses the kitchen and this large family room – with its barn like roof. This room was divided into several seating areas with the middle portion centering around a large armoire that hides the flatscreen. While this room is as large as the living/dining room – the feeling in this room is much more casual, but no less beautiful. Notice the large cow sign that adds a touch of whimsy. on this side, she used a larger check mixed with a subtle stripe. The checks in soft blues mixed with the khaki linens add a unifying design factor to the large house – another lesson learned here. By using the same basic colors and patterns throughout – the rambling house seems connected and cohesive. Another design lesson from Ginger. Off the family room is this screened in porch with an eating area and two sitting areas. A close up of one of the sitting areas with its assortment of birdhouses. Here you can see the swimming pool on the left that the screened in porch overlooks. What a porch! And, finally, here is the kitchen. This kitchen looks at home in the upscale farm house - it’s not an over the top design that plagues many large kitchens these days. The kitchen overlooks the screened in porch. And here is the wing with the screened in porch, the pool and the pool house on the right. A HUGE thank you to Ginger Barber for allowing me to show this beautiful house! I hope you enjoyed seeing how a classic American farm house can be right at home in the heart of Texas! 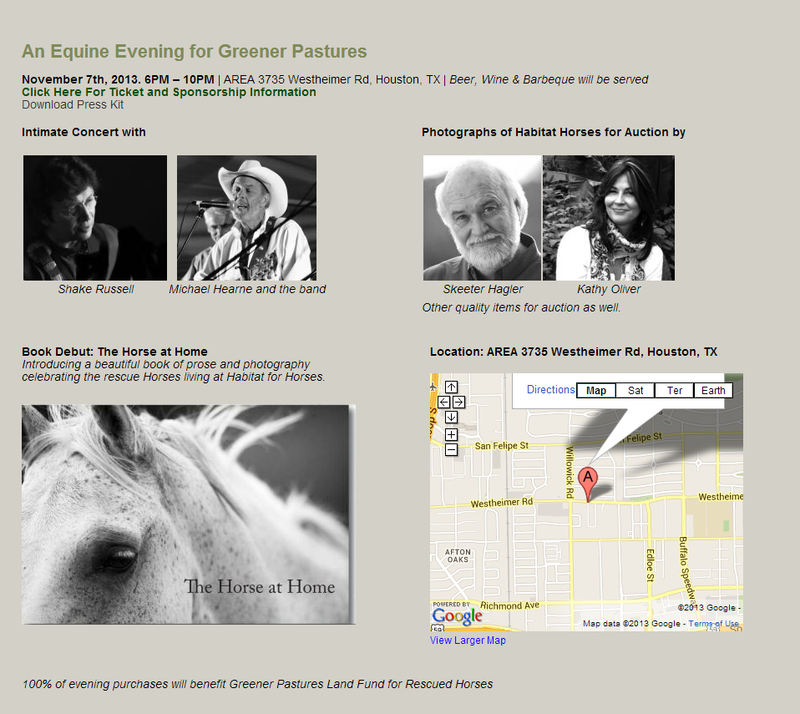 Coming up soon is the fundraiser for Ginger’s passion – Habitat for Horses. The event takes place this November 7th at AREA. For more information, go HERE! If you can’t attend, please consider a small donation for this worthwhile charity. There is absolutely nothing to say about this house. It is so perfect, the pictures say everything. What an amazing retreat!! My absolute dream. Truly amazing, thanks to Ginger and you for sharing, it is a dream home! Thanks for the shoutout on Habitat for Horses, going to make a donation. This home leaves me speechless! This has to be one of the most GORGEOUS homes you've ever featured! Absolutely the most perfect I've seen in ages. Thanks for sharing. While I am not always a fan of the furnishings and fabrics Ginger selects, in this instance I had to keep reminding myself that this was a country and casual home. I agree, I love that it is "American" as you say. The home and property are truly wonderful and who could possibly not want to have lots of family visiting with the comfort this home offers. Lovely post! Thanks for sharing. I love everything, especially the porch! I see you weren't sleep as usual with a 3:26 am post. Beautiful American home. Thanks for sharing this with us. The porch takes my breath away, love screened in porches! Ginger Barber has a fantastic way of mixing furniture. Love all her selections and would love to know what manufacturers she used. Thanks so much for sharing such an amazing house! Joni, you've made my day. This house is absolute perfection! It makes me long to take a trip to my home state, just to see this gorgeous place! Thank you for bringing a bit of Texas excellence into my life today! I'm putting this post in my design file to reference as we begin work on renovating our home! Absolutely breathtaking!! I have always loved Ginger's style of decorating - understated elegance. Truly a classic home that will always be in style! Thanks for sharing, Joni. That may be my favorite house from all that you have shared, Joni! That home is amazing- the landscape/setting is incredible. Love the magazine rack thingy to the left of the fireplace in the family room (rather than the 'expected' shelves)- adds so much character. Great decor. Beautiful home. Speechless! I truly can't even absorb it all, it's so fabulous. I am studying every inch. Ginger has done things I wouldn't have the confidence to do: combining large and small check fabric in the same room, and on the porch wicker in a washed finish at the dining end, and a darker finish in the seating area. I would have been afraid to do that, which is why Ginger is a master. This is one of the loveliest homes you've featured. It is extremely large, yet manages to be welcoming and not imposing. Love! Best, Beth C.
Good eye! I missed the different wicker finishes on the porch the first time through. I don't think I like it, though. in person - her houses are even prettier. you have to see the quality there. she's a master. I adore this house! I love the "collected" look of the furnishings.......(including the different wicker "finishes" on the screen porch! It doesn't look like the "decorator just left"! And it is large; however, so comfortable and intimate. BRAVO Ginger! It is hard to make a" great big new house " feel warm and wonderful! My favorite detail is the clock-tower that reminds me completely of my favorite decorator's house in England......Haseley Court; the house of the greatest of them all; (in my opinion): Nancy Lancaster! I was so lucky to get to see it!! (she lived there until she died! She ended up selling it and living in the "coach house")!!! The loveliest people bought it from her.....they owned it when I visited it! This house reminds me of the feeling of that house! Big; yet cozy. Very difficult to accomplish!! Oh my! It is all amazing. I LOVE the way the designer uses so much white and cream and then adds just one pop of color. THIS HOME IS STUNNING! The decor, the landscape, the location, the structure and that pool! An absolute American dream. I am thoroughly impressed with Ginger's design. I paid particular attention to the window dressings used here, as that is my next step in my own home. I remember a quarrel a few posts back about the look of drapes and the shades, being a "Texas" design. Regardless of the debate, I think in this case it was perfectly suited!!! I appreciate today's lesson. Thank you for sharing with us!!! OMG -that house is amazing!!! The level of detailing is incredible -i'm off to that architects website! My pinterest page just exploded. My absolute favorite house EVER! I love all of the architectural elements throughout this classic American home. Thank you for such a gorgeous post. This is my new "go-to" house. PERFECT. A well-designed, well-built house that is inviting and warm for all it's size. The materials are honest and timeless; that house will age well and be treasured long after those flashy homes built with the mere force of money have been bulldozed. The landscape is so fine tuned to the house's needs and the natural site, it seems to have always been there. One question, is that the natural color of the stone, or is it whitewashed? Either way would be historically accurate. With whitewash, one will be able to keep it as fresh as those New England homes dating from the Revolution. If the stone is naturally that color, it will age into a warmer, softer hue with time, settling the home even more firmly into the landscape. The interiors are perfectly suited to the architecture. The staircase inside is perfection. That home will be a local favorite for generations; money wisely and thoughtfully well-spent. i think it was whitewashed! but call Ginger's office to be sure if you really need the correct answer! i think in luxe it said whitewashed. I think it looks like the "plaster" or "white mortar" Brooke and Steve Giannetti put over their stone on their house in Ojai they just built! Joni; have you seen it? 9 months . From a vacant lot to a landscaped house and they moved in!! "Velvet and Linen"! If I hadn't seen it with my own eyes I would never have believed it! You would love it, too!! Ginger has outdone herself! A very subtle relaxing home in spite of its size! No pretentiousness or grandeur! This seems like a true classic filled with taste and subtleness. This is absolutely gorgeous! Love Ginger's style and her mix of upholstered pieces. Nothing is overdone or pretentious. Refined but comfortable. The detail in the architecture is fantastic, too. the decor in the home has been gathered over time total perfection. Call Ginger's office! I'm sure they will share! Great garden. Focal points on axis with interior views. AND, garden focal points are on multiple axis. Rare to see in USA. Brava! oh how I loved this house...I could look at these wonderful photos over and over. btw..Michael Hearne is so good...he's from Taos and plays there often...really good! Exactly. Beautiful, beautiful home. A livable home! We move quite a bit, so all the furniture in our home is in the same color palette and we collect things over time - but my home doesn't look like this! I'm following her major concepts, but her attention to detail is quite amazing - and raises this home to a much higher level! What an amazing property. I love the authentic feel it has and the interiors are a perfect complement to the architecture. I do, however, have to disagree about the chandeliers in the living/dining area. While I think they are gorgeous, the busyness of the bead work conflicts with the crown molding and the use of three further exaggerates the problem. I would have used two and forgo the beads if this were my project. Thanks for sharing, Joni! You always feature such beautiful homes. no, they do not conflict with the crown molding, i disagree. just look to italy, france, portugual, their castles all have very "busy" chandeliers and crown molding. Agree, the beading bothered me, too. A little too junky to my eyes. The chandeliers would look more elegant without it. The chandeliers do look cheap and actually using only two and eliminating the beading would leave a cleaner look in what is already a very busy space. I also would eliminate the straingely placed floor lamps. A large round dining table would have looked better given that the room is so rectangular. While not opposed to leather seats in a dining room, nor leather on French chairs, these chairs look more appropriate for an office conference room. While I think the home, garden and decor are as beautiful as everyone her is saying, I have to agree with most of your suggested "corrections". The dining room chairs screamed "conference room" to me and I love leather furniture! I enjoyed a lot this post. Thanks for providing us with such example of fine decoration. Don't you wish the front door matched the size and scale of the rest of the house. Why is it so small? I wondered about the simplicity of the front door, though the fanlight gives it more presence. Believe it or not, sometimes architects think of the entrance last instead of first - a big mistake. It is possible that this home has had several additions to the original footprint which may then account for the scale of the entry. The scale of the front door (with its beautiful fan-light) is certainly not a mistake. This was no oversight of the architects. This is a masterful job of making a new house look and feel like a centuries-old farmhouse that was added on to when the next generations needed new and additional spaces. It is just the opposite of the "McMansions" that are pretentious and hideous and out-of-proportion that have invaded our land! This is an authentic, beautifully designed and built "farmhouse" that looks as though the stone center......was the "original"!! It is comfortable, cozy, intimate......and a heavenly place for 3 (hopefully four) generations can gather and everyone can enjoy! Leather on chairs and barstools are completely "kid-proof"! This is as close to perfection as I have ever seen in a great big house! Bravo to the team! This took excellent architects, excellent contractors, and an excellent decorator! It deserves many awards........thank you soooooo much, Joni, for showing us!! BRAVO!!! Thank you for giving me something to day dream about today. I'm entranced with the architectural details in this house. It looks like the windows employ real sash weight and pulley systems. Wow, I never see that in new construction (though I have them in my old house). And those are triple hung sash windows in the living/dining room! Also, in the detail showing the column base of the living/dining room, it looks like there was a light sand-through on the woodwork, apparent here on the column base, baseboard, and cabinet doors. Or possibly it's a glaze, and the hang-up makes the details on the raised panels pop. I wonder if this treatment was used on all the mouldings, including the heavy dentil mould? I'd love to know how they treated the woodwork. Where do I even begin... I'll take it!!! Love beyond Love!! Lots to love, as others have pointed out, so I'll only mention a couple of things I didn't like. First, the dead space between curtain rod and inside-mounted shades on the smaller windows in the master bedroom (raising all of the shades to rod level would have looked better). Second, the furniture placement around the flat screen TV in the family room. With nine bedrooms one might assume that multiple people may wish to watch television together. Right now, only 3 adults and one child can watch TV together comfortably (the flanking sofas are only good for an adult lying down; adults seated on the sofa would have to crank their heads to the side to watch TV -- so NOT comfortable.) Having at least one sofa facing the flat screen and swivel armchairs flanking, or use of a sectional (this is a casual room) would have been more practical. Agree about the TV watching in the family room - wondered the same thing. However, I disagree about the shades in the master bedroom. There are substantial casings around the windows and it would be a shame to cover them up. Plus, if you look at the large windows across from the bed, the line of the shades and top of curtains is much closer together (only the height of the window casing separating them) because of the extra height of the windows. The curtain rod is placed at the bottom of the crown just above the window casing. They kept the curtain rods at the same height on the windows on the side wall (at the bottom of the crown) and the shades inside the casing for consistency. There is nothing that special about the window casings that merits leaving that dead space. The room has enough architectural interest in the crown moldings and ceiling beams. I think I'd sooner consistently cover up the dead space, than highlight the casings. Enormous, yet warm & cozy. Magnificent. Lots of excellent architectural elements. The only things I questioned were the contrast in the living room between the heavy dentil moldings and pillars (formal) vs. thin beams and plank ceiling (casual), the family room's unusual door jambs, the differing window heights in the master bedroom (complicates window treatments), the second floor terrace railing (the thick parts look heavy and obscure the windows), and the mishmash of fireplace styles (living room classic, master sitting room rustic, master bedroom French). I loved the clock tower poolhouse, folly, and the house's overall exterior (although I probably would have kept it completely symmetrical). That's the first thing I noticed about this house. There are too many differing styles going on in the moldings and trims. Dentil molding would be the last element I would have used in this house and never windows of differing heights in the same room. You are criticizing the very things that make it authentic. It isn't supposed to be a new "perfect" house. Its idiosyncrasies are its charm. It isn't what everyone would like. I find it "perfect in its imperfection"! And charming in its quirkiness! To each his own! My favorite house I have ever seen is "Beauport" in New England. (a house museum) .......and it is quirky beyond! (quite livable, also!!) This house is quirky and immensely livable!! Rare indeed!!! My all time fav! What a house! This is one of my favorites of all the homes you've featured. I really love the casual, laid-back vibe of the understated interiors, and the architectural details and the property itself are just incredible -- it's like something out of a period film, like you've stepped back in time. Magnificent! Beautiful..those vistas and surrounding property are to die for...the views much be spectacular from every window! I love that you can't tell when it was built/decorated, its ageless. Very elegant but cozy (not easy for a 16,000 sq ft house) and inviting, its restrained without being dull. Beautifully done, my two favorite rooms are the great room and the sun room...what a beautiful spot. The only thing I questioned which seemed almost out of place was the stark white stair banister I would have liked to see a pickled pine or a warm soft wood or if a paint maybe more of a taupey color..the white just doesn't seem to blend harmoniously with the rest of the house in my humble opinion. Joni, this was a treat....your posts are so thorough that I literally always feel like I have been to the house and walked around inside and out! Great job. I have always said if I win the lottery, I am heading straight to Ginger! This house is beautiful in every way. Personally I wouldn't want every fireplace, molding & window to match. The triple hung windows did catch my eye. What luxury that would be on a beautiful Texas day. Thanks to you and Ginger for sharing!! I don't believe that anyone suggested that every fireplace, molding or window should match, but they should be consistent in style with the architecture of the house. That is the mark of a good architect and good design. Otherwise, it looks like the owners said "I want one of that, and one of this, etc., etc. which I call the candy store effect. Disagree. Not for this house. This house looks like it evolved over centuries! What a spectacular timeless home! This house could be new, 50 years old or 100 years old and perfectly beleivable. It is the English Countryside brought to the Texas Hill Country. My favorite style in my favorite place. I love everything about this home! Classic, gracious, simultaneously comfortable and impressive. There are so many wonderful living and entertaining spaces. I adore the sunny screened porch and the elegant staircase. As always, Joni, you have featured it beautifully. Love the old world charm of the furnishing, so elegant :) I wish my home will be just as stylish! I just got a new apartment and I'm so excited about decorating! Please do an inspiration board for 1000 thread count flat sheet or bedroom style inspiration! So glad you were able to share these photographs with us! I'm sure the limited magazine spread just didn't do it justice! Holy Moly, I keep waiting to see Madeline Stowe come down those stairs. It looks like the revenge house. Love it but it is so huge, wouldn't know where to sit. Hee hee. And to think, this isn't the family's full time home is that right?. I wonder if they need a caretaker to live in the house while they are away - I'm available! I disagree with you, I think it feels European in that everything looks comfortable and inviting, not new and perfect like lots of American homes. The staircase landing is so beautiful I keep going back to the photo, the one with the little dog. I don't think I have ever seen such a wondrous staircase. My other favourite thing in a house is a front door which gives a direct view right through the house to the back door. The sofas and furnishings are perfect. Sigh. I believe Joni meant the exterior architecture when she was talking about the house looking American. It is not a French or Italian house recreated on Texas soil. However, the interiors, as you've indicated, do look collected over time, as is the case in many European homes. There are a number of interesting pairs of antique chairs that make some of the spaces look collected, but essentially that's it. I don't see this home looking European. Every room in the house has the same color palate and it is simply a typical Ginger Barbour construct. There are all manner of European decors from the very formal and traditional to minimal. This home is casual American/Texas/California. I see nothing that sparks an assumption that the furnishings cannot be purchased every day of the week through any Houston designer. Thanks Joni one more time i find some great roof design ideas on this site. This is really helpful for me in future when i started my own roof installation business in Maryland area. I hope you always try to help me in future by sharing these kind of informative post here. Great to visit this site!! Hi Joni: I wasn't sure I would like this house thinking it would be another McMansion, but, I was pleasantly surprised. I LOVE Ginger's work and it is so beautiful and understated here, I'm amazed. I agree with you that the house really looks American, the kitchen is very understated and, not overdone, as you astutely point out is a problem with many homes these days. I love how the colors and patterns tie in together as well. For as large as the house is, it really doesn't have the 'feel' of a cavernous McMansion - far too many homes look so uninviting and impersonal and frankly, ugly. You just wouldn't want to live in them. Although I prefer a smaller house, I think I could live here - and I love the wet bar! It seems a perfect place for a bourbon and branch, always the choice of drink for the quintessential Texan, JR Ewing!! (also one of my favorite actors RIP Larry Hagman). Enjoy your Sunday!! This is so amazingly beautiful!!! It may be American but certainly not Texan to my eyes. Very much a Virginia plantation with touches that reminded me of Mt. Vernon. I love this house......(you already know)! I found the perfect quote! "The secret is to make it (the second home) look like it's always been there, perhaps like a house that's been added to over time, which is the Cape Cod vernacular. It means compounds where there might be a guest-house, a studio, lofts, a barn like structure--a place where people can have their privacy but get together." That says it all to me! Bingo! This house did it all!!! I'd like to enter a correction: Credit for the landscape design of this property should recognize Curtis & Windham Architects in addition to Sarah Newbery, who was the principal in charge of the landscape design.